This thread may be used to remove background flares from any ACIS dataset. The ACIS blank-sky background datasets were created for quiescent-background periods. So it is important to filter your dataset to remove periods of background flares before using the blank-sky files in the analysis. 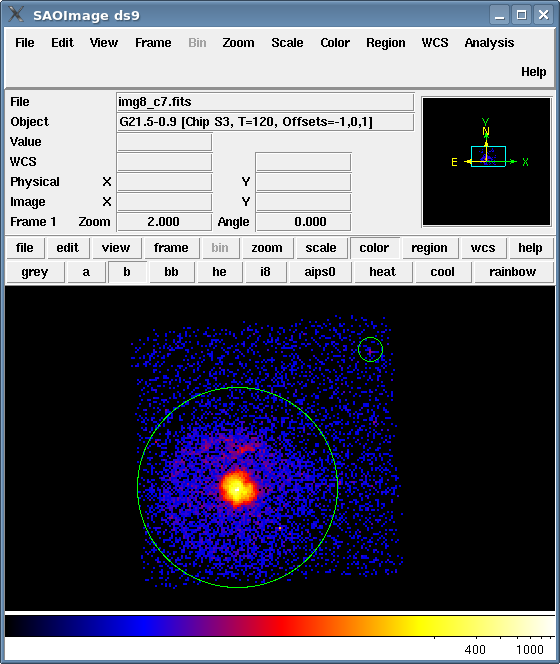 To remove background flares from an ACIS observation for spectral fitting or images for spatial analyses. The lc_clean() routine removes flares (and periods of anomalously-low count rates) from lightcurves using the same technique as used on the ACIS background files. The simple cleaning used by the lc_sigma_clip() routine in the Filtering Lightcurves thread is a more conservative approach. The selection of a "true" background can be critical, as discussed in M. Markevitch's memo: astro-ph/0205333. Last Update: 17 Dec 2014 - Review for CIAO 4.7; no changes. ObsID 1712 is used as an example of a strong background flare. The regions defined in region file sources.reg overlaid on the image. These times will be used as the lower and upper limits for extracting the lightcurve. The filter could also be defined as "[bin time=::259.28]", in which case the TSTART and TSTOP header values are used for the endpoints. This approach is valid, though it will probably create some empty bins in the output lightcurve, since that time range is longer than the good time interval. unix% pset dmextract infile="1838_c7_bg.fits[bin time=84245789.155:84253741.155:259.28]"
The file 1838_c7_bg.lc contains the lightcurve for the data. You can check the parameter file that was used with plist dmextract. The lc_clean() routine from the Python module lightcurves.py selects those regions of the lightcurve that do not contain flares. The algorithm used is taken from the lc_clean program created by Maxim Markevitch, and is different from that used by the lc_sigma_clip() routine in the Filtering Lightcurves thread. The deflare script provides a command-line interface to lc_clean. There is an example of using deflare at the end of this section; see the ahelp file for more information. The top plot shows the lightcurve of 1838_c7_bg.lc, where the time axis is displayed on the x axis as a relative value (the first bin in the lightcurve is used as the zero point). Points that are in green are those that passed the sigma-clipping and the horizontal dotted line shows the mean value of these points (the numerical value is given in the plot title). In order to create a GTI file, we need to specify an output filename; here we use "1838_c7_bg.gti". The command also creates Figure 3. The top plot now indicates the regions excluded by the GTI file created by lc_clean - here 1838_c7_bg.gti - using a solid red pattern. Since we specified an output file, the lc_clean() function has run dmgti, using the calculated range, and created the file 1838_c7_bg.gti. You can check the parameter file that was used with plist dmgti. Light curve cleaned using the lc_clean routine. The new event file, 1838_c7_clean.fits, is ready for use. The Analysing the ACIS Background with the "Blank-Sky" Files thread shows how to select a background file and match it to the event data. unix% pset dmextract infile="1712_flare.fits[exclude sky=region(exclude.reg)][bin time=77379634.145:77407432.550:259.28]"
When lc_clean() is run on this lightcurve, the routine finds that the filtered lightcurve contains less than ten percent of the original exposure, and so stops (this limit can be changed by setting the option minfrac to something other than 0.1). The diagnostic plot that is created (Figure 4) shows that the default options do not do a good job with this lightcurve. The log_scale calls are used to change the scaling of the rate axes in both plots. StandardError: Fraction of bins that are good (0.0185185, 2 of 108) is below limit of 0.1! The strong flare means that the routine does not pick up the "quiescent" level in this obeservation. Since the X axis of the bottom plot is linked to the Y axis of the top plot, the log_scale has changed the scaling in both plots (e.g. compare to Figure 2). The resulting plot (Figure 5) shows that more data is included but that the data is still noisy, which suggests that care probably needs to be taken in interpreting the results. Forcing the initial calculation to use a mean level of 0.35 count/s has resulted in more points being marked as good. However, the curve is still noisy and many times are excluded, as indicated by the regions of solid red color. The use of AUTO for the minimum value in the limits call means that the limit is calculated from the data. See the lc_clean help file for more information on changing the filtering scheme used by the routine. Maxim Markevitch's Cookbook contains advice on filtering lightcurves with strong flares. (clobber = yes)             Clobber output file if it exists?